Objective: To compare the prognostic abilities of lactic acidosis and hyperlactatemia and determine the influence of metabolic acidosis when attempting to predict the outcome of septic patients using serum lactate levels. Method: 126 patients with severe sepsis or septic shock were prospectively included in this study at an emergency department. Haemodynamic variables, simplified acute physiology score (SAPS) II, arterial blood gas studies and serum lactate levels were obtained at the time of presentation (0 h) and 4 h after presentation. The probability of mortality was calculated using SAPS II scores and compared with actual inhospital mortality at different serum lactate levels and arterial pH. Survival curves for lactic acidosis and severe hyperlactatemia were analysed using the Kaplan–Meier method. Results: The calculated probability of mortality decreased from 35.7% (95% CI 30.2 to 41.2) at presentation to 29.3% (95% CI 24.2 to 34.4) at 4 h post-presentation. 27.0% of patients (34) died in hospital. Arterial pH and SAPS II scores were independent factors for predicting mortality of septic patients, at 0 h and 4 h. Serum lactate levels were closely related to severity of illness and metabolic acidosis in septic patients. 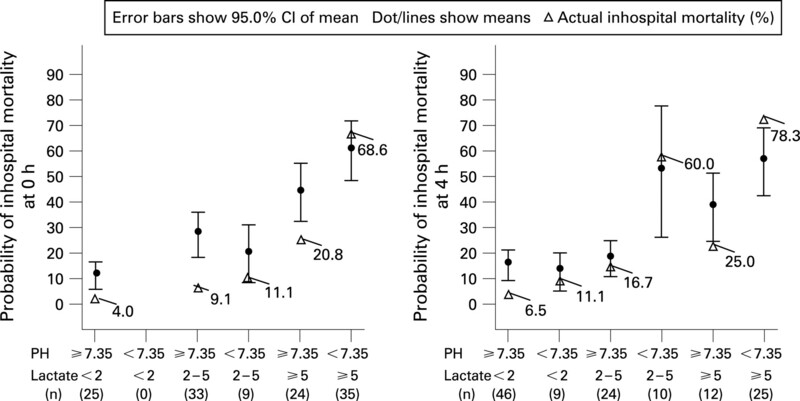 Patients with lactic acidosis had significantly higher inhospital mortality than patients with normal pH and normal lactate levels by Kaplan–Meier survival analysis as determined based on measurements made at 0 h and 4 h (p<0.001, p<0.001 by the log-rank test, respectively). No significant difference in survival was found between patients with hyperlactatemia and those with normal pH and serum lactate levels. Conclusion: Lactic acidosis not hyperlactatemia was found to predict inhospital mortality more exactly in severe sepsis and septic shock patients. The acid-base state should be considered when attempting to predict the outcome of septic patients using serum lactate levels. Tissue hypoxia is one of the most important prognostic factors in septic patients.1 2 If uncorrected, tissue hypoxia can drive the pathogenic effects of sepsis and lead to organ failure and death.2 Moreover, tissue hypoxia induces lactate production, and numerous studies have concluded that serum lactate can be used as a prognostic marker of global tissue hypoxia in circulatory shock. However, the merits of a single serum lactate determination as a marker of tissue hypoperfusion are debatable,3 4 and therefore serial measurements of serum lactate or lactate clearance rates have been used to predict mortality.5 6 Moreover, the importance of lactate clearance remains an issue for study and it is uncertain which of the absolute serum lactate level on admission or lactate clearance is the better predictor of patient outcome. Although hypoxic tissues have elevated rates of anaerobic glycolysis and lactate production, well-oxygenated tissues can also generate lactate via aerobic glycolysis.7 Lactate generated via tissue hypoperfusion is, however, associated with high serum levels and metabolic acidosis.7 In addition, dysfunctional tissue perfusion in septic shock reduces lactate and hydrogen ion elimination from tissues and thus aggravates lactic acidosis. Mild to moderate hyperlactatemia frequently presents as an endogenous accompaniment to elevated endogenous catecholamines after shock or trauma.3 Hyperlactatemia without acidosis does not, however, predict mortality in septic shock.8 In order to use serum lactate as a prognostic indicator, it is important to differentiate lactic acidosis and hyperlactatemia (normal pH and an elevated lactate level). We hypothesised that lactic acidosis (high serum lactate levels with metabolic acidosis) may more accurately reflect tissue hypoperfusion and be more closely related to mortality in septic patients than hyperlactatemia without metabolic acidosis. The aims of this study were to compare the prognostic abilities of lactic acidosis and hyperlactatemia and to determine the influence of metabolic acidosis when attempting to predict the outcome of septic patients using serum lactate levels. This was a prospective observational study of a series of adult patients enrolled from January 2005 to June 2007. Our Institutional Review Board approved the study and waived the requirement for informed consent. The study was carried out in a 590-bed university teaching hospital with a 40-bed emergency department (ED) that provides care for approximately 40 000 patients per year. The mean ED stay time was 247 minutes (SD 74). The primary outcome was inhospital mortality. Blood pressure, respiratory rates, heart rates and electrocardiography findings were routinely monitored and patient demographic information and admission diagnoses were recorded. The arterial blood gas variables, CVP, Scvo2, pH and serum lactate levels were obtained at the time of presentation (0 h) and at 4 h after presentation. Measured values (blood pressure, arterial pH, serum lactate levels, etc) were compared for survivors and non-survivors. Estimated lactate clearance was calculated by dividing the difference between serum lactate levels at 0 h and 4 h post-presentation by the lactate value at presentation. Multiple logistic regression analysis was used to identify variables (at 0 h and 4 h post-presentation) that were independently associated with death. Significant variables at 0 h and 4 h were entered into a backward, stepwise, logistic regression model. Changes in the probability of mortality, as determined using the SAPS II score and serum lactate levels were analysed to determine the nature of the relationship between sepsis severity and serum lactate level. The relation between arterial pH and serum lactate was investigated to determine the relationship between serum lactate and metabolic acidosis. Patients were categorised into six groups based on arterial pH and serum lactate level as follows:7 12 (1) normal (pH ⩾7.35 and serum lactate <2.0 mmol/l); (2) mild hyperlactatemia (pH ⩾7.35 and serum lactate 2.0∼5.0 mmol/l); (3) severe hyperlactatemia (pH ⩾7.35 and lactate ⩾5.0 mmol/l); (4) only acidosis (pH <7.35 and lactate <2.0 mmol/l); (5) mild hyperlactatemia with acidosis (pH <7.35 and lactate 2.0∼5.0 mmol/l); (6) lactic acidosis (pH <7.35 and lactate ⩾5.0 mmol/l). Actual inhospital mortality was compared with the probability of mortality to compare the treatment outcome between the groups. The survival curves of the severe hyperlactatemia and lactic acidosis groups were drawn using the Kaplan–Meier method at 0 h and 4 h post-presentation and were compared with those of the normal group using the log rank test. All statistical analyses were carried out using SPSS version 11.0, and the data are expressed as means (SD) or as means (95% CI). Continuous variables were compared using one-way analysis of variance or Student’s t-test, as appropriate. Proportion was compared using the χ2 test. p Values of less than 0.05 were considered significant. Six patients with do-not-attempt-resuscitation orders and one patient requiring immediate surgery were excluded. A total of 126 patients was analysed in this study. There were 48 septic shock patients. The probable mortality of patients determined using SAPS II decreased from 35.7% (95% CI 30.2 to 41.2) at presentation to 29.3% (95% CI 24.2 to 34.4) at 4 h, after initiating ED therapies. Thirty-four patients (27.0%) died in hospital and their median survival (minimum–maximum) was 3.5 days (1–26). Upon admission, the most common diagnosis was pneumonia (table 1). After initiating ED therapies, the mean SAPS II score of the study patients at 0 h and 4 h post-presentation improved from 43 (SD 20) to 39 (SD 19) (p = 0.093). Mean arterial pressures, heart rates, body temperatures, arterial blood pH values, arterial oxygen tension (Pao2)/fractional inspired oxygen (FIo2), base deficit and serum lactate levels were significantly different for survivors and non-survivors. At 4 h post-presentation, mean arterial blood pressure and CVP in both survivors and non-survivors were significantly improved compared with 0 h values. No significant difference in lactate clearance was observed between these two groups (24.6% versus 20.9%, p = 0.547) (table 2). Significant variables at 0 h and 4 h, incidence of mechanical ventilation, mean arterial pressure (MAP), heart rate, respiratory rate, body temperature, arterial pH, Pao2/FIo2, serum lactate levels and SAPS II were introduced into a backward, stepwise, logistic regression model (table 3). Base deficit was excluded from the regression analysis, because of a high correlation between arterial pH and base deficit (r = 0.842 at 0 h, r = 0.756 at 4 h). The SAPS II values and arterial pH levels were found to be independently associated with increased mortality at 0 h and 4 h post-presentation. At 0 h and 4 h post-presentation, serum lactate levels were significantly and positively correlated with base deficit (r = 0.808, p<0.001, r = 0.704, p<0.001, respectively) and significantly and negatively correlated with arterial pH (r = −0.777, p<0.001, r = −0.666, p<0.001, respectively). Patients with a serum lactate level of 10 mmol/l or greater at both 0 h and 4 h post-presentation showed significant arterial pH depression (fig 1). Figure 1 The relationship between serum lactate levels and arterial pH. High serum lactate levels were associated with significantly lower arterial pH values. 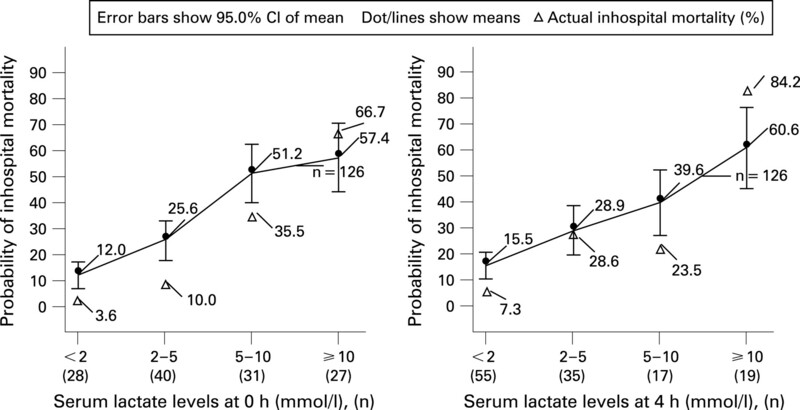 The probability of inhospital mortality and the actual inhospital mortality increased with increasing serum lactate levels as determined at both 0 h and 4 h (fig 2). At 0 h, the actual mortality of patients with a serum lactate level of less than 10 mmol/l was significantly lower than expected based on the calculated probability of mortality. Similarly, at 4 h post-presentation, the actual patient mortalities of patients with a serum lactate level of less than 2 mmol/l or from 5 to 10 mmol/l were significantly lower than expected based on calculated probabilities of mortality. At 4 h post-presentation, after emergency resuscitation, the actual inhospital mortality of patients (n = 19) who had high serum lactate levels of 10 mmol/l or greater was significantly higher than the probability of mortality. A total of 19 patients had 65 mm Hg (SD 21) of MAP, 10.2 cmH2O (SD 3.2) of CVP and 64.7% (SD 13.9) of Scvo2. Figure 2 Probability of mortality determined using the simplified acute physiology score II and actual inhospital mortality according to serum lactate levels. Actual mortality and the probability of mortality increased with serum lactate. Discordances were observed at lower serum lactate levels. The actual mortality of patients who had lactate of 10 mmol/l or greater after emergency resuscitation was higher than the probability of mortality. At 0 h, actual mortality was lower than the probability of mortality for the normal group, mild hyperlactatemia and severe hyperlactatemia groups (fig 3). At 4 h post-presentation, the normal group and severe hyperlactatemia group had significantly low actual mortality compared with the probability of mortality. At 4 h post-presentation, patients with mild hyperlactatemia with acidosis showed a high probability of mortality and high actual mortality, and the actual mortality of patients with lactic acidosis was significantly higher compared with the probability of mortality. At 4 h post-presentation, after emergency resuscitation, the actual inhospital mortality of patients with lactic acidosis was significantly higher than the probability of mortality. Figure 3 Comparison of the actual inhospital mortality and the probability of inhospital mortality in previously defined groups. Discordances were observed in the normal group, mild hyperlactatemia group, severe hyperlactatemia group and lactic acidosis group at 4 h. At 4 h after emergency resuscitation, the actual mortality of patients with lactic acidosis was significantly higher than the probability of mortality. Mean serum lactate levels (minimum–maximum) in the lactic acidosis, severe hyperlactatemia without acidosis and acidosis with normal lactate level or mild hyperlactatemia groups were 14.2 mmol/l (5.3–29.8), 7.1 mmol/l (5.0–15.8) and 2.5 mmol/l (1.9–4.8) at 0 h (p<0.001) and 13.8 mmol/l (5.1–26.2), 8.2 mmol/l (5.0–16.5) and 2.6 mmol/l (1.5–4.9) at 4 h (p<0.001), respectively (fig 4). Patients with lactic acidosis showed significantly higher inhospital mortality than normal patients at both 0 h and 4 h post-presentation. No significant differences were observed between the survival curves of patients with severe hyperlactatemia and normal–mild hyperlactatemia patients at both 0 h and 4 h.
Figure 4 Survival curves (truncated at 28 days) produced using the Kaplan–Meier method for the normal group, severe hyperlactatemia, acidosis (with normal lactate or mild hyperlactatemia), lactic acidosis. Log-rank (at 0 h and 4 h); normal versus hyperlactatemia: (2.38, p = 0.305, 2.39, p = 0.122), normal versus acidosis: (0.84, p = 0.359; 13.34, p<0.001), normal versus lactic acidosis: (25.03, p<0.001, 30.42, p<0.001), acidosis versus lactic acidosis: (7.23, p = 0.007, 3.46, p = 0.063), respectively. In our study, at both 0 h and 4 h post-presentation, SAPS II and arterial pH, rather than serum lactate, were found to be independently related to the inhospital mortality of septic emergent patients. These results are similar to those reported by Stacpoole et al,13 who found that the APACHE II score, systolic blood pressure and arterial pH at 24 h most strongly predicted mortality in patients with lactic acidosis and that lactate level did not predict survival. SAPS II reflects the physiological status such as age and chronic illness, admission type, haemodynamic status and organ dysfunction in patients.11 Multiple organ dysfunction increases mortality in patients with severe sepsis or septic shock, and haemodynamic variables, such as MAP, are associated with mortality in septic shock.14 In the present study, non-survivors showed unstable vital signs (eg, low blood pressure and a rapid heart rate), hypoxia and a high incidence of septic shock. In addition, SAPS II provides an estimate of the risk of death without having to specify a primary diagnosis.11 We thus used SAPS II as a marker of sepsis severity and as a predictor of mortality risk. Severe tissue hypoperfusion produces much serum lactate and hydrogen ion and decreases the elimination of them from tissue, which aggravates lactic acidosis.18 In this study, patients with high serum lactate levels (⩾10 mmol/l) showed severe acidosis and their probability of mortality was high (fig 3). Persistent lactic acidosis after resuscitation may reflect uncorrected tissue perfusion. If dysfunctional tissue perfusion is not corrected, persistent tissue hypoxia may result in multiple organ dysfunction and high inhospital mortality.1 2 In this study, high serum lactate levels (⩾10 mmol/l) and lactic acidosis after emergency resuscitation showed higher actual inhospital mortality than the probability of mortality (fig 2). Indeed, they had low MAP and Scvo2. In addition, patients with lactic acidosis after initial resuscitation also showed high actual mortality compared with the probability of mortality. These results indicated that persistent lactic acidosis after initial resuscitation may reflect that persistent tissue hypoperfusion results from the inadequacy of resuscitation. Mizock and Falk12 reported that the severity of lactic acidosis in critically ill patients correlates with overall oxygen debt and survival. In this study, actual mortality in patients with lactic acidosis was highest at both 0 h and 4 h. Patients who had lactic acidosis showed significant differences in the survival curve when compared with patients who had normal lactate levels and normal pH at both 0 h and 4 h post-presentation. However, there were no significant differences in survival curves between severe hyperlactatemia without acidosis and the normal group (fig 4). Although the serum lactate levels of the severe hyperlactatemia group were significantly lower than those of the lactic acidosis group, the severe hyperlactatemia group had high serum lactate levels, which were clinically significant in other studies.15 16 They did not, however, have acidosis. We thus postulate that the acid-base state of septic patients should be considered when using the serum lactate level as a predictor of outcome. Lactic acidosis has been defined in various ways in the literature. Currently, the most accepted definition of lactic acidosis is a serum lactate level greater than 5 mmol/l and a pH less than 7.35.7 Depending on the definition used, mortality rates vary between 30% and 88%.7 In this study, the mortality rates of patients with lactic acidosis at 0 h and 4 h post-presentation were 68.6% and 78.3%, respectively. In this study, we measured haemodynamic variables at ED presentation and 4 h later. These times were chosen because the mean ED stay time for emergency patients at our institution was approximately 4 h.
This study has several limitations. First, base deficit was not included in our definition of lactic acidosis. Stacpoole et al13 defined lactic acidosis as an arterial lactate concentration of 5 mmol/l or greater and an arterial pH of less than 7.35 or a base deficit greater than 6 mmol/l, whereas we defined lactic acidosis as a serum lactate level greater than 5 mmol/l and an arterial pH of less than 7.35. Husain et al19 reported that serum lactate levels appear to be superior to corresponding base deficit levels for predicting mortality in critically ill surgical patients, and Smith et al20 found that the combination of lactate and base excess predicted mortality better than either of these two variables alone. However, we consider that these differences in the definition of lactic acidosis affect primary outcomes minimally, because of the high correlations between base deficit and arterial pH and the serum lactate level. The second limitation is that we did not have a device measuring Scvo2 continuously, but measured Scvo2 intermittently at 0 h and 4 h post-presentation using central venous blood gas analysis. We thus could not use a Scvo2 value of 4 h post-presentation as an early goal of sepsis treatment. In the present study, however, the Scvo2 value at 4 h post-presentation guided the treatment of patients in the intensive care unit. Nevertheless, our findings indicate that bedside measurements of lactic acidosis in severe sepsis or septic shock patients may provide emergency physicians with useful prognostic information during the course of sepsis. Further studies will be needed to overcome some of the above-mentioned limitations. In conclusion, patients who had hyperlactatemia without acidosis showed discordance between actual mortality and probable mortality. Initial lactic acidosis that includes high serum lactate levels and metabolic acidosis more precisely predicted the inhospital mortalities of severe sepsis and septic shock patients than hyperlactatemia without acidosis. Therefore, the acid-base state should be considered when attempting to predict the outcome of septic patients using serum lactate levels. Moreover, persistent lactic acidosis after emergency resuscitation showed significantly higher inhospital mortality compared with hyperlactatemia without acidosis. The measurement of both serum lactate levels and arterial pH may be a useful marker of the subsequent adequacy of resuscitation in septic emergency patients.
. The microcirculation is the motor of sepsis. Critical Care 2005;9(Suppl 4):S13–19.
. Persistent microcirculatory alterations are associated with organ failure and death in patients with septic shock. Crit Care Med 2004;32:1825–31.
. Lactic acidosis during sepsis is related to increased pyruvate production, not deficits in tissue oxygen availability. Ann Surg 1996;224:97–102. , Coffernils, et al. Serial blood lactate levels can predict the development of multiple organ failure following septic shock. Am J Surg 1996;171:221–6.
. Early lactate clearance is associated with improved outcome in severe sepsis and septic shock. Crit Care Med 2004;32:1637–42.
. Lactic acidosis: from sour milk to septic shock. J Intensive Care Med 2005;20:255–71.
. Significance of hyperlactatemia without acidosis during hypermetabolic stress. Cri Care Med 1997;25:1780–1.
. Surviving sepsis campaign guidelines for management of severe sepsis and septic shock. Crit Care Med 2004;32:858–72.
. Practice parameters for hemodynamic support of sepsis in adult patients: 2004 update. Crit Care Med 2004;32:1928–48.
. A new simplified acute physiology score (SAPS II) based on a European/North American multicenter study. JAMA 1993;22:2957–63.
. Lactic acidosis in critical illness. Cri Care Med 1992;20:80–93.
. Natural history and course of acquired lactic acidosis in adults. Am J Med 1994;97:47–54.
. Hemodynamic variables related to outcome in septic shock. Intensive Care Med 2005;31:1066–71.
. Serum lactate as a predictor of mortality in emergency department patients with infection. Ann Emerg Med 2005;45:524–8.
. Serum lactate as a predictor of mortality in patients with infection. Intensive Care Med 2007;33:970–7.
. Clinical review: acid-base abnormalities in the intensive care unit. Critical Care 2005;9:198–203.
. Lactic acidosis. Endocrinol Metab Clin North Am 1993;22:221–45.
. Serum lactate and base deficit as predictors of mortality and morbidity. Am J Surg 2003;185:485–91.
. Base excess and lactate as prognostic indicators for patients admitted to intensive care. Intensive Care Med 2001;27:74–83. Ethics approval: The Institutional Review Board approved the study and waived the requirement for informed consent.